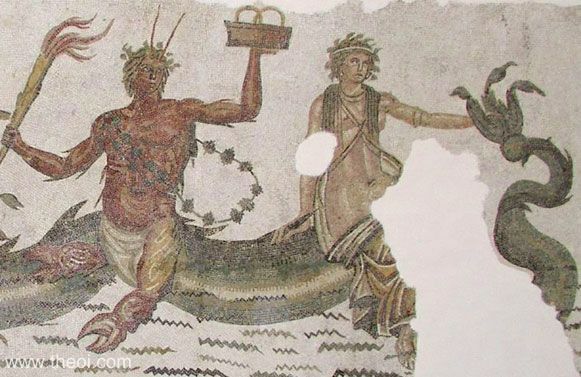 KETO (Ceto) was the goddess of the dangers of the sea and, more specifically, of sea-monsters, whales and large sharks (all called ketea in Greek). She consorted with her brother Phorkys (Phorcys) to produced a brood of fearsome monsters including--the she-dragon Ekhidna (viper), sailor-devouring Skylla (crab), the hundred-headed serpent Ladon, the one-eyed Graiai (grey ones), and the petrifying Gorgones (terrible ones). As the mother of Skylla Keto was also named (Crataeis, of the Rocks), Lamia (the Shark) and Trienos (the Thrice). The last title appears to equate her with the thrice-swallowing whirlpool-monster Kharybdis (Charybdis). Krataiis was also identified or confused with the goddess Hekate (Hecate), a divinity whose power extended over the sea. There was also a river named Krataiis in the territory of the Brutti, near the Straits of Messina in Italy. "And Pontos (Pontus, the Sea) begat Nereus . . . And Pontos again fathered great Thaumas and proud Phorkys (Phorcys), being mated with Gaia (Gaea, the Earth), and fair-cheeked Keto (Ceto) and Eurybia." "And to Phorkys (Phorcys) Keto (Ceto) bore the Graiai (Graeae), with fair faces and gray from birth, and these the gods who are immortal and men who walk on the earth call Graiai, the gray sisters, Pemphredo robed in beauty and Enyo robed in saffron . . . and the Gorgones (Gorgons) who, beyond the famous stream of Okeanos (Oceanus), live in the utmost place toward night, by the singing Hesperides : they are Sthenno, Euryale, and Medousa (Medusa) . . . But [Keto] she bore another unmanageable monster like nothing human nor like the immortal gods either, in a hollow cave. This was the divine and haughty Ekhidna (Echidna), and half of her is a Nymphe with a fair face and eyes glancing, but the other half is a monstrous snake . . . [and] Keto, joined in love with Phorkys, mothered the youngest of the deadly Drakones (Dragon-Serpents) . . . that one which guards the all-golden applies." "By him [Phorkys (Phorcys)] she [Keto (Ceto)] conceived and bare the Gorgones (Gorgons), fearful monsters who lived in Sarpedon, a rocky island in deep-eddying Okeanos (Oceanus)." "The children of Pontos (Pontus, the Sea) and Ge (Gaea, the Earth) were Phorkos (Phorcus), Thaumas, Nereus, Eurybia, and Keto (Ceto) . . . Phorkos and Keto had the Phorkides (Phorcides) [the Graiai (Graeae)] and the Gorgones (Gorgons)." "The hateful den of Ausonian Skylla (Scylla), the wicked monster borne to Phorkys (Phorcys) by night-wandering Hekate (Hecate), whom men call Krataiis (Crataeis)." "From Pontos (Sea) and Terra (Earth) [Gaia] [were born] : Thaumas, tusciuersus, Cepheus [probably a corruption of Ceto and Phorcys] . . .
From Phorcus and Ceto [were born] : Phorcides, Pemphredo, Enyo, Persis (for the last others say Dino). From Gorgon and Ceto, Sthenno, Euryale, Medusa." "Scylla, daughter of the River Crataeis, is said to have been a most beautiful maiden."